A baby gift as unique as the baby it is for! How long does it take to get the blanket? What are some popular color choices? What can I put on the blankets? Are the borders and the edging extra? What is the custom border? What if I order more than one? Where are the blankets made? Have you considered using natural materials? How do you pick the contest winner? Allow 3-4 weeks for the blanket to be made. It does take time to knit a personalized blanket like this from scratch but so did the treasured blankets many grandmothers lovingly made for their families. Shipping times are in business days. Overnight shipping is not offered. Allow an extra day or two for remote areas. The receiving blanket is 33 x 24 inches (width x length) or 83cm x 60cm, a nice size for a car seat and it's also a good size for a toddler to carry around. The Crib blanket is 33 x 42 inches or 83cm x 106cm and makes a beautiful crib spread. Our most popular Blankees™ Brand Baby Blankets have the white letters and edging. We have a shade of white called "warm white". It is an "off-white" and it goes well with the darker blanket colors like the Dusty pink and the Navy blue. Light yellow with white letters. Light Yellow with warm white letters. Forest green with dark blue letters. Dusty pink with lilac letters. Baby pink with white letters. As a rule the reverse of these colors are also not recommended. NOTE: We do not allow returns on these color	combinations. Check out our current yarn selection. What can I put on the blanket? Your message may consist of Christening dates, baby's names, birth statistics, poems, personal messages, etc. Each line can have up to 10 large letters or 20 small letters (including spaces). There can be up 3 lines on a Receiving size blanket and 6 lines on a Crib blanket. Additional lines are available. Are the borders or edging extra? The picture borders on the blankets are included, as is the edging/trim. It is only the personalization that you provide that varies. This is an easy	way to add an extra special touch to your Blankees™ Personalized Baby Blanket. We replace the hearts/blocks/butterflies in the bottom border, depending on the style of blanket you have chosen, with a message of your choice! The custom border can be up to 3 lines with a maximum of 20 characters per line. This option is available for the Teddies & Hearts, Toy Blocks and the Butterflies styles. This is a highly personalized product and we feel it is best to use our secure online order forms for submitting your order information with the greatest accuracy. After your order has been placed you will receive an email auto reply within a few minutes from our server acknowledging receipt of your order. Your order will be reviewed by staff and a second email with your order summary will be sent to you. Your order summary is attached as a PDF file for your review (one last chance for corrections!). This is a highly personalized product and these steps are nessassary to help avoid costly mistakes. You can call our toll free number 1-888-Blankee (252-6533) to place your order but we prefer the online form for accuracy reasons. Telephone orders will still have to go through an email verification process so that we can double check that we have everything correct. NOTE: RAD Enterprises o/a www.blankees.com will not request your credit card information at any time. You do not have to submit any credit card information when placing your order. If everything in your order summary was correct then click on the "Pay Invoice" link in the email. This will open a secure PayPal web browser window where you can	use the credit card of your choice. 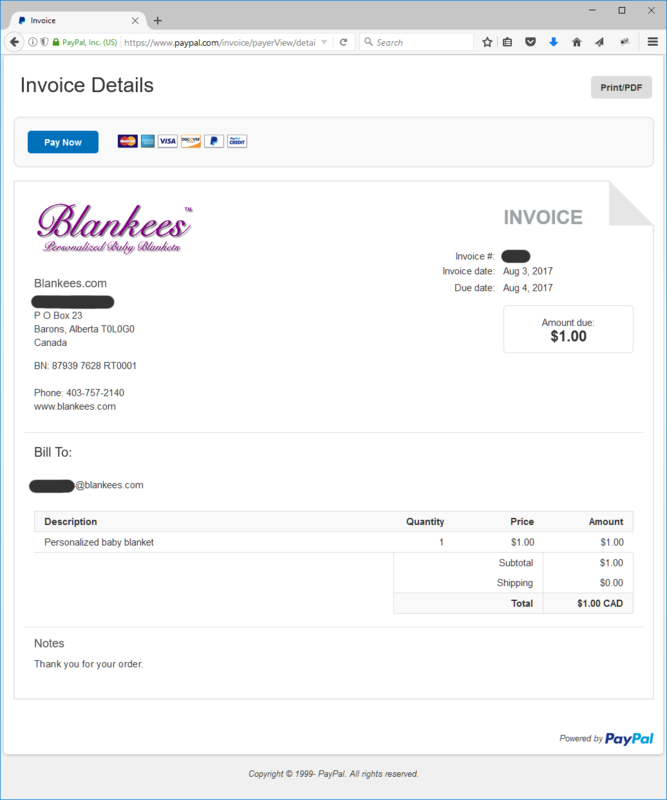 You can click on this link to see what this sample PayPal invoice looks like. NOTE: You DO NOT need to have a PayPal account and there is no cost to you to use their secure payment services. The PayPal system is well known and widely gaining acceptance. We use PayPal as our credit card processor (they are one of many) due to the large number of International customers that we service. When sending two or more blankets to the same address you must still submit and order for each blanket. You can not order more than one blanket at a time. Choose a shipping option for the first blanket so we know the shipping service level you desire. We combine your orders (going to the same address) and pass on the shipping savings. See the shipping cost section on our Prices for more information. Since each blanket is individually made we can not offer any discounts on the Blankees Personalized Baby Blankets themselves but we do pass on any savings resulting from shipping more than one blanket to the same mailing address. Blankees Personalized Baby Blankets are made in Canada. Click for more info. We will not be offering cotton in the foreseeable future. Blankees™ Personalized Baby Blankets are made with 100% acrylic premium acrylics and are machine wash & dry. We started making personalized baby blankets in 1990 and went online in 1995. Our site, blankees.com, was established in 1997. We cover our	product with a 100% satisfaction guarantee. If you are not absolutely delighted with your Blankees™ Personalized Baby Blanket it may be returned for a full refund. Returns must be clearly marked as "Returned goods" on the outside of the package or there is a $15.00 Customs fee. Please call us first before returning your Blankees™ Personalized Baby Blanket. Note: Before you order please double-check the birth information for accuracy. We'll fix our mistakes (a rare occurrence) but yours will cost you. This is custom work and mistakes require the complete remake of the blanket for correction. How do you choose the contest winner? We use the Web interface at random.org to generate random numbers for the day, hour, minute and second of the winning entry. This is why it is a good idea to send in your daily entry to maximize your odds of winning. If you would like more information on how this particular random number generator works see random.org's essay.